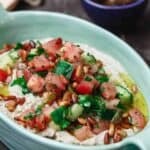 If you’re looking for a healthy party dip that will bring all the wow, you need to try this baba ganoush! A smoky, rustic, super creamy eggplant dip, loaded with flavor from tahini, Middle Eastern spices, garlic and a splash of lemon juice. This one is even better the next day, when all the flavors had a chance t o marry. I love finishing it with a generous drizzle of EVOO, toasted pine nuts, and a heaping scoop of my lazy 3-ingredient Mediterranean salad. Low Carb. Vegetarian (can be vegan). Gluten Free. Be sure to see the tutorial and check out all the tips! Mezze is the unofficial meal of the Middle East. 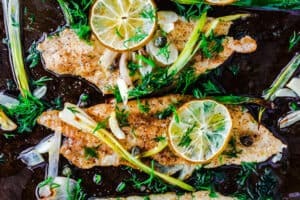 If you’re invited for dinner, you better expect a spread of mezze to start the evening…From the familiar hummus and tabouli to even a few falafels, kibbeh bites, or savory pies. Among the different mezze options and dips, you’ll find some version of this smoky eggplant dip, also known as Baba Ganoush. 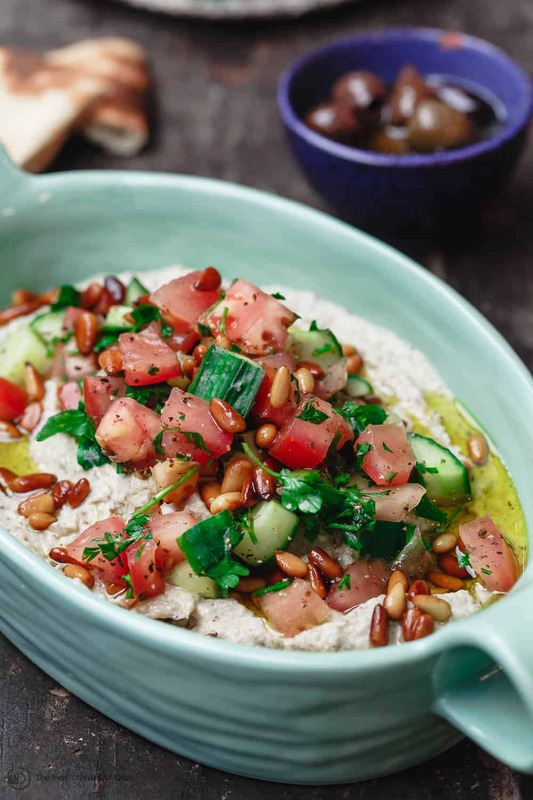 No, you’re not imagining, we’ve had the baba ganoush conversation before when I shared this easy recipe. This eggplant dip is another version you absolutely need to know! The key to this baba ganoush recipe is in concentrating the rich flavor of eggplant over an open flame. You can cook the eggplant indoors over a gas burner (as I did here), or outdoors on a gas or charcoal grill. The idea is to smoke the eggplant until well-charred and crispy on the outside, and super tender on the inside. The extra smoky and velvety tender eggplant makes the base of this dip. And it’s glorious! The loaded part of this eggplant dip? A few scoops of my lazy 3-ingredient Mediterranean salad. It’s a simple salad of tomatoes, cucumbers and parsley. Such a fresh and festive addition that compliments the earthy, smoky flavors in the dip. In my earlier baba ganoush recipe, I roasted the eggplant in the oven. That’s a very fine option if you can not smoke the eggplant. 1. Here, we begin with cooking one large eggplant over a high-heat gas burner until it’s well charred and super tender on the inside. Remove the eggplant with a pair of tongs and be sure to let it cool before handling. Once the baba ganoush is blended, I like to cover and refrigerate the dip (before adding anything else to it) for 30 minutes or so. This is to give flavors a chance to meld, but also to help the consistency of the dip. 4- Here is the fun part. Just before you’re ready to serve, drizzle a generous amount of quality EVOO, add some toasted pine nuts (optional, but awesome.) Then scoop some of that fresh Mediterranean salad on top. 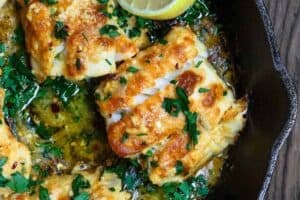 Serve with warm pita bread or pita chips. Maybe a few olives on the side. You do not need a food processor to blend the eggplant dip. And especially if you want to avoid over-blending and creating a runny dip, you can use a bowl and a fork to manually mash the eggplant with the remaining ingredients. If you do this, be sure the garlic is well minced. 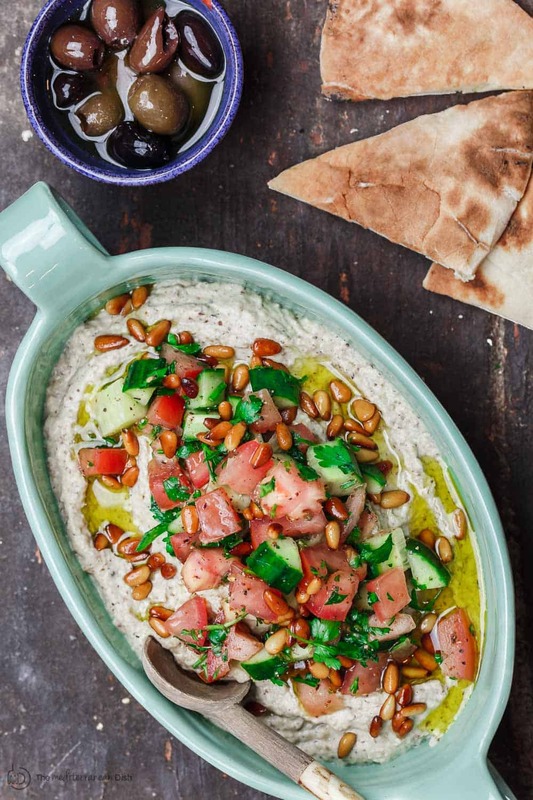 To make the baba ganoush dip ahead of time, refrigerate it in a tight-lid glass container. Be sure to only store the dip without the salad or pine nuts on top. It will keep well for up to 3 days. You can also prepare the Mediterranean salad ahead of time and refrigerate separately in its own glass container. You can make it the night before, and drain excess liquid before using with baba ganoush. If you think you might end up with leftovers, it’s best to serve the salad on the side and allow guests to simply scoop as much as they want of the salad. Of course, if you don’t have a way to cook the eggplant over an open flame, use this easy baba ganoush recipe instead. 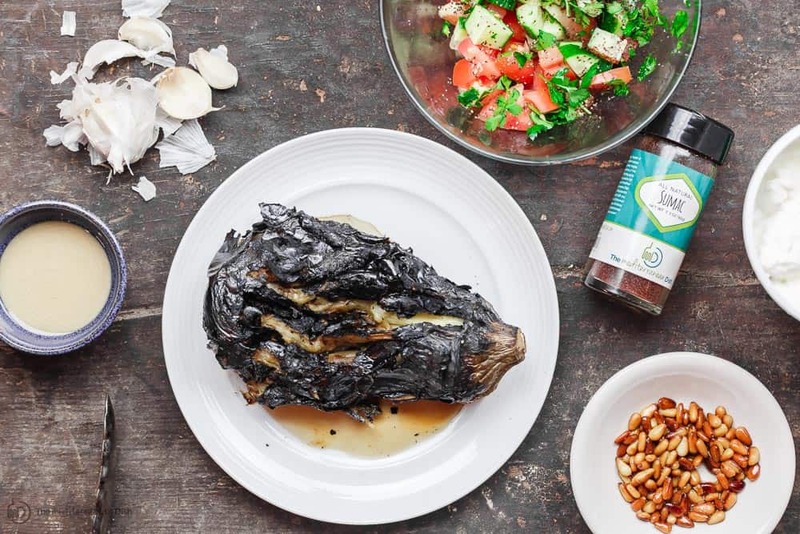 As the smoky baba ganoush recipe gives a little taste of the Levant and places like beautiful Syria, I’m so honored to partner with World Vision in support of their work particularly among Syrian refugees. Did you know that the Syrian refugee crisis is the biggest refugee-related crisis in modern history? It has gone on for seven years now! In that one small corner of the world, already some 400,000 people were killed, and 11 million displaced. I think of all the homes destroyed, and the thousands of children born and raised into fear, hunger, and scarcity. It may not be possible to restore normalcy to refugee children. But, every effort to bring them a warm meal, or to help them manage in any way, makes a difference. This is why my family decided to support refugee children through World Vision. 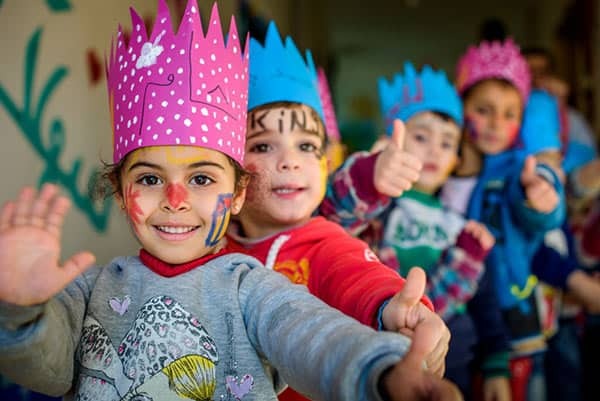 I’m so grateful for their work in providing necessities like food and medicine, and their big efforts in bridging the education gap to help Syrian children learn while displaced. Thank you for letting me share my heart with you today. This is just a brief glimpse, and if you’re curious to learn more, please visit World Vision’s FAQ page. And if you’re looking to join with a year-end contribution, please go here. Of course, World Vision’s work extends to many parts of our world, so be sure to look through their site! This baba ganoush is a smoky eggplant dip with tahini, garlic, lemon juice and spices. I add a little Greek yogurt to make it extra creamy, but you can omit this to keep it vegan. 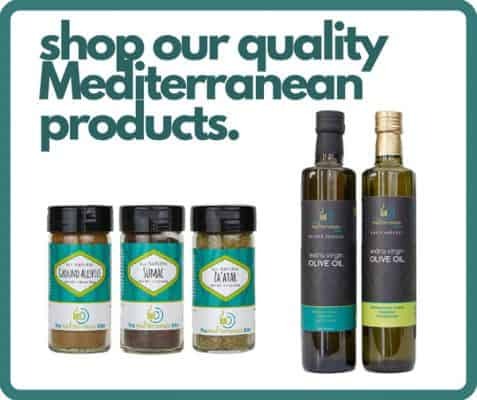 Topped with a drizzle of extra virgin olive oil, toasted pine nuts, and a simple Mediterranean salad. Be sure to see the notes for important tips and make-ahead instructions. Make the salad topping. In a bowl add tomato, cucumber, and parsley. Season with salt, pepper, and sumac. Add lemon juice and a generous drizzle of extra virgin olive oil. Toss and set aside. 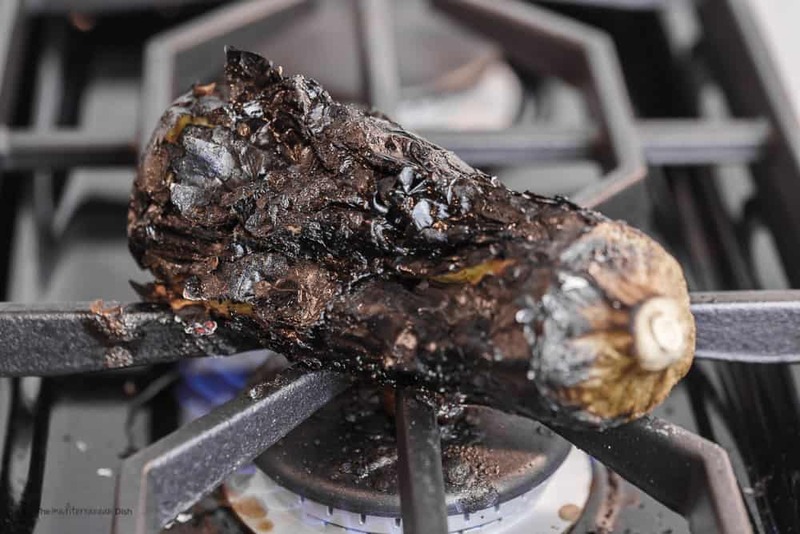 Smoke Eggplant: Turn 1 gas burner on high. Using a pair of tongs, turn eggplant every 5 minutes or so until the eggplant is completely tender and it’s skin is charred and crispy (about 15 to 20 minutes.) Don’t worry if the eggplant deflates, it’s supposed to. (You can also do this on a gas or charcoal grill over medium-high heat.) Remove from heat and let the eggplant cool. Remove Eggplant Skin & Drain Excess Water. Once eggplant is cool enough to touch, peel the charred crispy skin off. Discard the stem. Transfer eggplant flesh to a colander; let drain for 3 minutes. 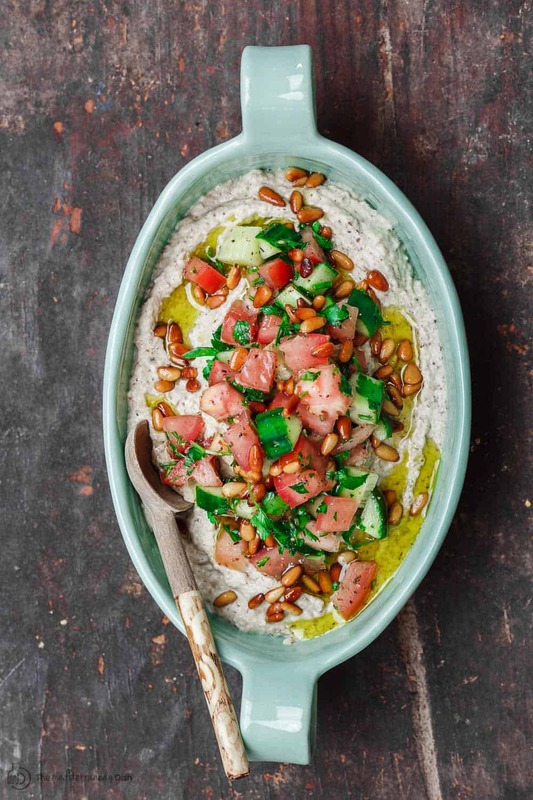 Transfer the smoky eggplant dip (baba ganoush) to a serving bowl. Cover and refrigerate for 30 minutes (or overnight). Bring eggplant dip to room temperature. Top with a generous drizzle of extra virgin olive oil. Add pine nuts. Spoon the salad on top (be sure to drain any excess liquid before adding on top of the baba ganoush.) 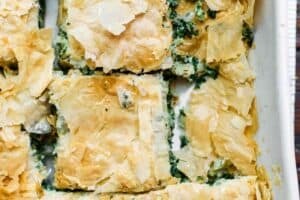 Serve with warm pita wedges or pita chips. Note: Allow 30 minutes of inactive time for the dip to chill. Pro-Tip: You are looking for a chunky, rustic eggplant dip here. Avoid over-blending with the food processor or it will be too runny. 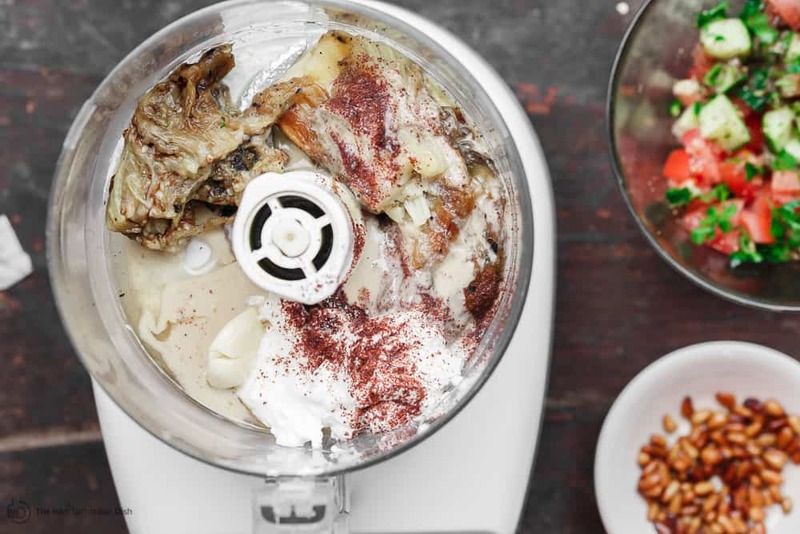 You do not have to use the food processor to blend the baba ganoush dip. If you’re afraid to over-blend it and make it too runny, then avoid using the food processor. Instead, use a mixing bowl and a fork to simply smash the eggplant and combine with the rest of the dip ingredients as listed. Make-Ahead Tip: You can prepare the eggplant dip (baba ganoush) ahead of time (steps #2 to #5). Refrigerate in a tight-lid glass container (without the salad topping). Baba ganoush will keep well for up to 3 days. Bring it to room temperature, top with EVOO, pine nuts, and the salad topping. You can also prepare the salad topping 1 night in advance, and be sure to refrigerate it in its own separate container. Drain excess water before using. Pro-Tip: If you prefer, you can serve the salad on the side instead and allow guests to spoon whatever amount of the salad on top of their dip as they please. Oven-Roasted Option: If you do not have the means to cook the eggplant over an open flame, you can roast the eggplant in the oven. Follow this easy baba ganoush recipe for instruction. Suzie can you help me out please? 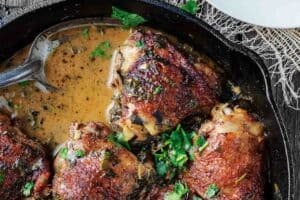 I’m looking for a smoky eggplant dip that is in a spicy red sauce? I think the origin is Persian not sure might be Pakistan! When I lived in Denver Avner owned the Falafel King on 16th Street and the other in Boulder! 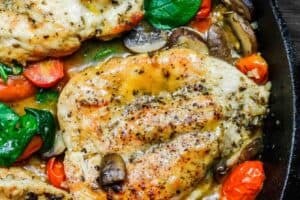 If I cannot find Aleppo Pepper’s, what type of pepper could be used instead ? So glad I tried this recipe! It’s fantastic. My husband really loved it! So fresh and delish! So glad to hear it, Toni! This is such a great dip, I would eat it every week! This eggplant dip is to die for! So good! Yay! Thanks so much, Sarah! Suzy, this is absolutely beautiful. Love Baba Ganoush and your recipe looks and sounds perfect. Love this unique dip recipe! Party perfect. The best Baba Ganoush I have ever had! Much better than the Greek restaurant in town! This is a real keeper! Beth, I’m so glad to hear it!